Everyone knows about the pirates of the Caribbean. Let’s talk about other pirates. Since I’m a medieval historian, I’ll stay firmly in the European world. Before we get started, a general comment: the lines between pirate, merchant, and rebel were blurry and ever-shifting. If you had a ship, it was sort of like having a pickup truck—you could use it for any number of enterprises. Few pirates were exclusively that. The real interest lies in the variations on our standard idea of piracy. Who were pirates? Given the comment above, pretty much anyone with a ship and a few followers could engage in piracy at one time or another, but there were a few places notorious for the practice of robbing other ships. Frisians were one. They lived along the coast of northeastern Netherlands; the region is still called Friesland. The Frisians were their own people, with their own language. 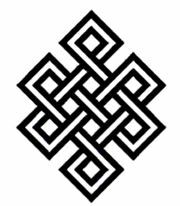 Their land is made up of a complex of islands and marshlands that were rarely the object of ambition from other peoples, so they rarely were under the foot of invading armies. The Frisians were constant raiders, not all that dissimilar to the Vikings, save that they did not try to invade and conquer. They were content to loot and go home. It just so happened that they were as content to do their looting at sea as on land. Frisians are a fine example of the muddy lines between pirate, merchant and rebel. Under the Carolingians, their ports flourished and Frisian ships traded as far as England, France, Denmark and into the Baltic Sea. This trade was largely ruined by the Vikings, who hit this part of Europe hard. By the 14th century, we encounter them as pirates preying on ships from Hamburg and Bruges, calling the Vitalienbrüdern. Eventually, they annoyed the neighboring Germans and Danes enough that they were conquered and their sailing skills were put to use by others. Pirates were a constant problem in the ancient world as well. 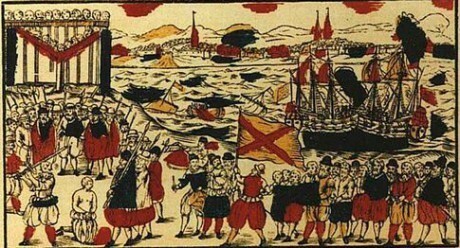 The pirates of Cilicia (southern coast of modern Turkey) once captured Julius Caesar. They later regretted that. The Great Pompey was given the task of clearing what Romans called Our Sea (the Mediterranean). He did so with Roman efficiency. He deployed a fleet and an army. Working in tandem, they moved along the coast from one end of Cilicia to the other. The navy destroyed their ships and the army destroyed their ports. Few kingdoms in later centuries had the resources to pull off an expedition of that scale. These fellows fall at the rebel end of the pirate spectrum. When the Spanish waged war in the Netherlands in the later 1500s, a number of ship owners decided to use their ships to harass the Spanish. They were sometimes effective, sometimes not, but they fairly consistently pocketed their prizes, arguing that they needed to cover expenses. Whenever peace broke out, the brave, patriotic rebels became pirates. When war returned, they were once again patriots. 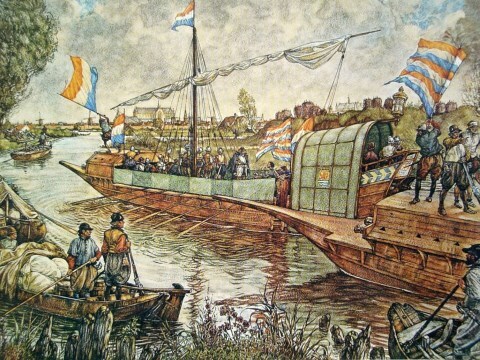 Their most famous exploit was the raising of a Spanish siege of the town of Leiden in 1574. River pirates could be found on the Thames in England, the Ganges in India, and the Yangtze in China (the Yangtze Patrol was made famous in the book and movie, The Sand Pebbles). There were even Cossack pirates, such as Stepan Razin. Once, Razin was surrounded by a Persian fleet in the Black Sea. The Persian commander put his ships in a circle, chained together, to keep Razin from escaping. The pirate ships were smaller and lower, completely vulnerable to the Persian cannon fire. But Razin attacked anyway. A lucky shot set off the powder magazine in the Persian flagship, sinking it almost instantly. When it sank, it dragged the other ships down with it and only three Persian ships survived. Razin sailed away unscathed. He rained terror and death along the Volga, the Don and into the Caspian Sea. He sacked Astrakhan and Samarra. At the height of his career he commanded several thousand followers and whole fleets of ships. 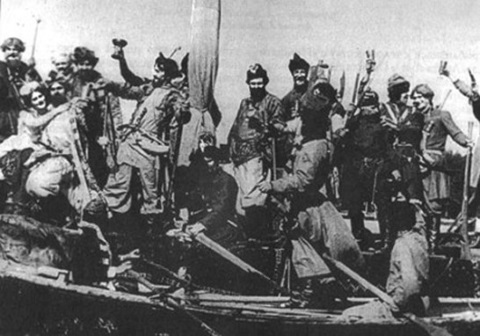 Other Cossacks also took to rivers. The most famous of these were the Ushkuiniks, who operated in northern Russia, around Novgorod. Their ships were remarkably slim and light (uisk in Russian means snake). Although they could hold as many as thirty men, the ship could be carried overland between rivers. Ushkuinik ships were frighteningly swift. There was Alfhild, the pirate princess. Daughter of Siward, King of the Goths. Beautiful, of course, but she went about hooded and cloaked so men would not be provoked to passion. She was to be married to the handsome Viking Alf, who himself was a great hero at sea. But she refused to marry. She and some friends dressed as men and commandeered a ship, then embarked on a career as pirates. According to legend, all her crew were women. Alfhild operated in the Baltic Sea and the North Sea, not on rivers, so technically she doesn’t belong here. I just like her story. Many so-called pirates were at least part-time merchants, glad to engage in peaceful trade when that was profitable, and equally happy to engage in piracy when that was the easier course. Stepan Razin’s pirates would enter as merchants and live in a place for weeks or months before turning on the population, stealing everything. In one case, forty of them entered as pilgrims. They went to the shrine, killed the guards, and opened the gates. In another case, the pirates posed as merchants bringing jars of wine. The weapons were hidden in the jars. River pirates could form whole flotillas. They typically had an island or swamp as refuge. It’s rare to find river pirates operating at sea, and vice versa, mainly because the ships and techniques are quite different. River pirates would make a great target for an expedition of heroes. Ship to ship battles are always colorful, and the climax could be the assault on the pirates’ island fortress. Also, your readers are less likely to know the details of non-seafaring ships. Since this is fantasy, why not add magic to the mix? River pirates might command currents, summon river monsters, or even be the ripuarian equivalent of mermen. Even if river pirates are not the focus of your book, they could make a colorful side-quest or could provide a rich secondary character or two. I don’t know of any fantasy tales that make use of river pirates. If you do, please let me know. I’ll update this article and give you credit! As for sea pirates, I don’t think anyone needs encouragement there. All I’ll add is that there’s room for a story about the moral ambiguity of a pirate’s career. The pirate could see himself as a defender of his people, while his enemies see him as a … well, as a dread pirate (with apologies to Mr. Goldman). How about you? Have you used pirates in any of your stories? Read any good fantasy pirate tales? The clear leader in that last category is Tim Powers (On Stranger Tides). How about any others? This entry was posted in ebook, Publishing and tagged Daily Writing Tips, DailyWritingTips, editing tips, historical fiction, historical novel, history, pirate, tips, writer, writing, writing practice, writing tips on June 20, 2018 by First Edition Design Publishing. By multi-published historical author Keli Gwyn! I’m excited to be back in Seekerville. Ruthy invited me in response to a comment I left on her thought-provoking post, “Writing Contemporary vs.Historical Books: Must We Choose?” Since I think Ruthy is the bee’s knees, I said yes. Ruthy suggested I blog about giving a historical story a dated feel, a timely topic I was eager to explore. Interesting, varied word choice and use of the English language in a way that is appropriate to era, setting, characters, etc. As an author of historical romance, a command of period-appropriate language is important to me as well as my readers. It’s nice to see that it ranks so highly on an editor’s desired elements list as well. But how does a writer go about creating that period-appropriate language? I have a few tips to share, but I wanted to give you more than I could come up with on my own. Because my stories encompass only a narrow slice of history, I got brave and sent out a zillion emails to some of the best and brightest stars in inspirational historical romance, asking them to provide tips for their periods as well. The generous authors flooded my inbox with a wealth of information, resulting in a post so meaty that I’m issuing each of you a virtual steak knife and fork. Enjoy the feast! Here are eight techniques used by many writers of historical fiction. This entry was posted in Publishing and tagged historical fiction, Keli Gwyn, writing on June 2, 2015 by First Edition Design Publishing. As novelists, we are always adding “real life” happenings to our stories. Bits and pieces. Here and there. Mashups of truth layered with fiction. But have you ever come across a real life story—your own or someone else’s, historical or contemporary—and wanted to use it as the plot of your entire novel? My guess is yes. And yet attempting to actually translate a true story into fiction is not as easy as it sounds. I ran up against this problem fifteen years ago when I wanted to write my great-grandparents’ story of love amidst the Great War and the Spanish flu pandemic. Wrangling it into fiction proved unwieldy, and I couldn’t quite figure out why. I set the story aside for nearly ten years. When I came back to it, I’d learned a few things that helped me take a story from my family history and turn it into a readable novel. This entry was posted in Publishing and tagged fiction, historical fiction, history, writing on January 22, 2015 by First Edition Design Publishing.